Benny truly is a hometown hero. He was born here and went to Ochoa Elementary School, Safford Junior High School and Tucson High School (1948-1951) and then went on to the University of Arizona. He graduated from the U of A with a B.S. in education and a Masters in secondary education. While at Tucson High, he lettered in baseball for three years, pitching and winning two state championships. He was an All-State choice for three years in baseball and played football for a year and a half until an injury forced him to give up the sport. He also played American Legion baseball for three years and is a member of the Tucson High “T” Club Hall of Fame. In college he lettered at the U of A for four years and was there when they played in the College World Series for the first time in 1954. In 1955 he was voted Most Valuable Pitcher and made the All-District 6 team. Benny was a teacher for Tucson Unified School District from 1959-1989, coaching girls’ basketball at Catalina High School for 13 years; coaching baseball and freshman and JV football at Sabino for four years; and coaching baseball, flag football, wrestling and track at Utterback Junior High School for 13 years. 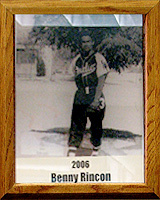 As a Student-player Benny was a member of the National Honor Society; received the Most Courageous Award; and the Don Bacon Memorial Award from the American Legion baseball program.